With HarrogateTown now 18 games without a clean-sheet, goalkeeper James Belshaw has admitted that he is “hurting”. 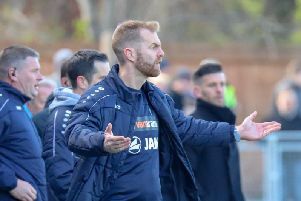 The National League play-off hopefuls last shut out an opponent four long months ago when when they beat Ebbsfleet United by a 2-0 scoreline away from home on October 6. And following a 4-2 FA Trophy humbling by National League North outfit Stockport County on Saturday, Town’s number one spoke candidly about his feelings on the matter. “You look at the run we’re on without a clean-sheet and it bothers you. It hurts,” Belshaw said. “It’s hard to come out and admit that, but we need to put it right , as an 11, as a club. “We need to stick together and keep grafting, but it’s disappointing. “It’s hurting all the lads, but me especially because as a keeper you’re judged on goals you concede. Defeat to Stockport cost Town a place in the quarter-finals of the competition as they looked to make history by securing a date at Wembley. And although disappointed by their exit, Belshaw said that the one positive to be taken was that the loss hadn’t cost the club any league points. “If there’s any silver lining, it’s that this was in the cup,” he added. “We had a good chance of getting to Wembley but now we have to focus on the league.